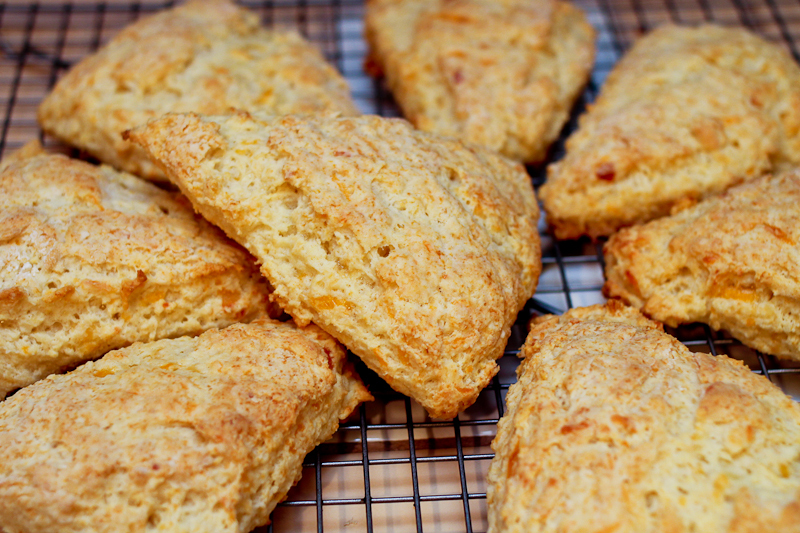 I made these feathery cheese scones to make a light meal more filling. The kids couldn’t get enough of them and have been asking me to bake them many times since, so I figured you might like them too? Not only are they easy and fast to make, you can vary the kind of cheese you use and you can also experiment with herbs, bacon and even sweeten them a bit. I wanted to try with green onions, but the kids vetoed my suggestion and we ended up with the cheesy ones – again. The scones are inspired by my days at Tante Marie’s Cooking School. Cut the cold butter into small pieces, then crumble the butter into the flour mixture until it resembles course sand. Stir in the grated cheese and set aside. In a smaller bowl stir together egg and yoghurt. Then add this to the flour mixture. Mix lightly, just enough to moisten the dough. Turn the dough onto a lightly floured surface and shape it into a circle about 1 “/ 2.5 cm thick. Cut into 8 wedges. Place the wedges on a parchment-lined baking sheet and bake for 15-20 min or until golden brown. This entry was posted in Breads & crackers and tagged cheese scones, feathery scones, light scones, oste scones, scones, scones opskrift, scones recipe, yoghurt scones. Bookmark the permalink.